Hendry Property Compliance Solutions Consultants started business in a residential house in the out skirts of Melbourne with a team of just 1. 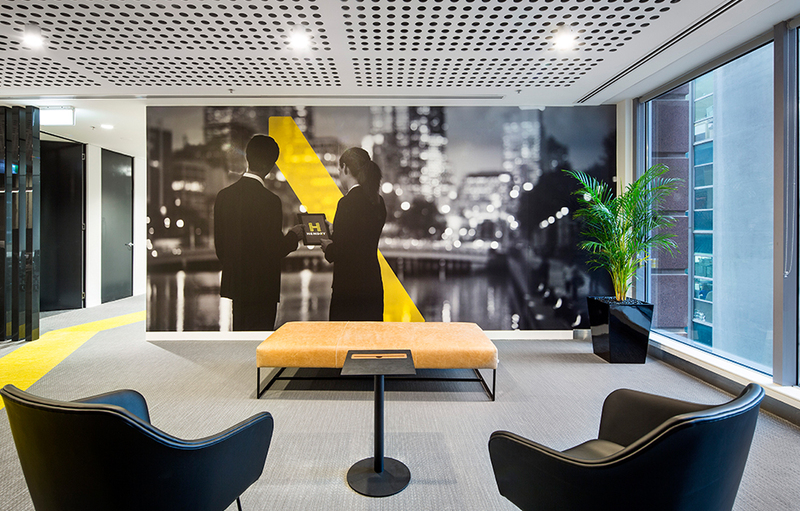 Having grown to a team of 70 in Melbourne, a new space was required to accommodate the increasing staff. The move was the perfect time to integrate its new brand identity into the new fit out. Rebranding ran concurrently with the fit out, and as the corporate colours had not yet been finalised, it was important to keep the base scheme quite neutral. A special emphasis was on creating a workspace that embraced the new way of staff interaction – open-plan, enhancing productivity and collaboration. A monochrome base palette allowed the team to play with different textures including timbers, concrete surfaces and perforated tiling to ceilings. 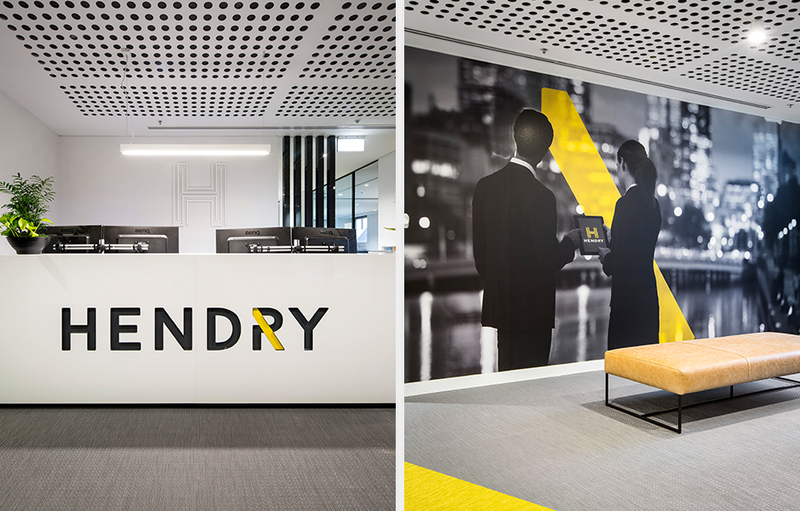 To show off the new identity, a striking reception area was developed, integrating interesting applications of finishes. Bolon was selected for the floor finish and acted as design element for a support beam wrapping up the wall and blending into the fibre cement cladding. A perforated set ceiling with natural timbers and 2 pac finishes on the joinery also added visual interest. The breakout area is designed for staff interaction, still employing the textual elements of timber and concrete and using some feature hues from the branding booklet in the furniture. The majority open-plan layout takes full advantage of the natural light coming through the full-height perimeter windows. All of the closed offices and utility points appear off the core, and different areas are divided with feature carpet tiles. Thoughtful orientation of the linear desks and storage solutions with natural plants appear throughout the open office area, maintaining a fresh and vibrant feel which compliments the natural scheme. Hendry provides a comprehensive Property Compliance Solutions consulting service including building permits, building code analysis, building audits, disability access audits, essential safety measures audits, emergency planning, and building permits. 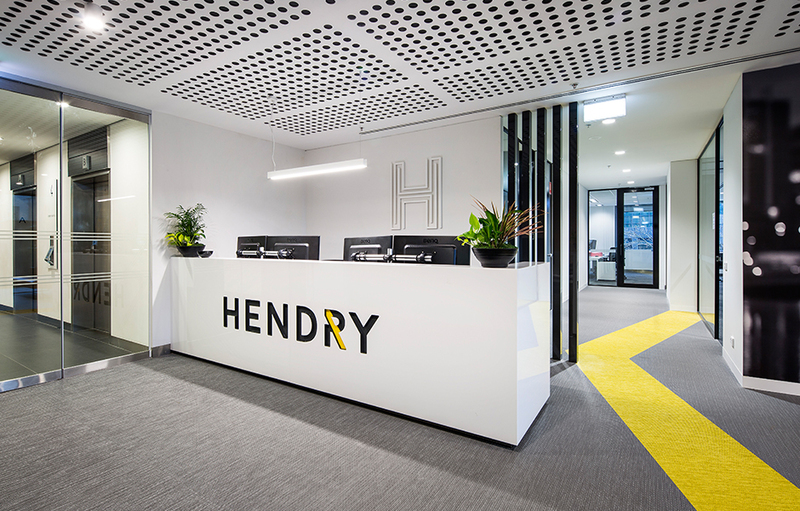 Having introduced and pioneered private building surveying certification in Australia in 1988, Hendry building surveying consultants have extensive building surveying and essential safety measures, experience in all sectors of the building and property industries, from government, residential and industrial, to commercial and mining.